Our wide professional experience has enabled us to develop a teaching system that combines the communication process with structured grammar that is integrated into the communication itself. In our courses we have integrated: oral comprehension, written comprehension, oral and written expression; and the three objectives: linguistic, communicative and sociocultural. This method is organized throughout the six levels (Europe common framework of Reference for Languages), to allow you to learn and perfect all the skills of the language according to your requirements, in a form both practical and enjoyable. Through different types of activities, you will acquire and perfect the skills of reading, listening, speaking and writing Spanish fluently. To learn a language means to live it and to do this one must immerse oneself in the culture. We offer our students the opportunity to be part of the local community and the possibility to interact with them. Our team of teachers has been carefully selected, according to their academic qualifications, experience, and professionalism. All our teachers have graduated from university and they regularly participate in practical courses on the art of teaching Spanish as a Foreign Language and the latest teaching methods. They have not only been chosen for their qualifications and experience, but also for their ability to work enthusiastically with students. Your teachers will help you establish some clear learning objectives and will encourage you to participate in Spanish from the very first day. Your classes will be stimulating. A1 (BEGINNER) You have little or no knowledge of Spanish. B1 (INTERMEDIATE) You feel secure speaking and writing in Spanish. You know quite a lot of vocabulary, but you need to practise and expand your grammar knowledge. B2 (UPPER) You can communicate fluently and with confidence in a wide range of situations but need a deeper study of grammar structures and learn more specific vocabulary. C1 (ADVANCED) and C2 (SUPERIOR) You should have an excellent level of Spanish and be able to communicate effectively as a native. You need to perfect the language to ensure its adequate cultural use by means of extensive study into the subtleties of the Spanish language. It is designed for people who want to learn or perfect their language skills from Beginners to Advanced levels, while enjoying their free time. 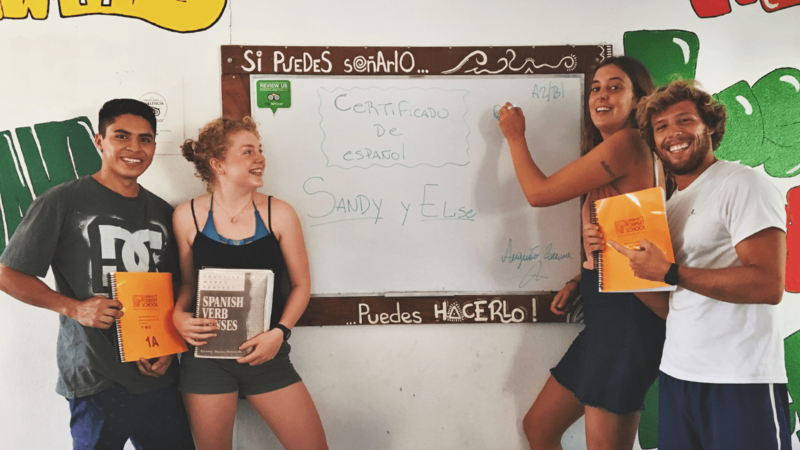 Spanish programmes in Santa Teresa, Costa Rica combine a holiday abroad with 8 / 16 spanish lessons a week. 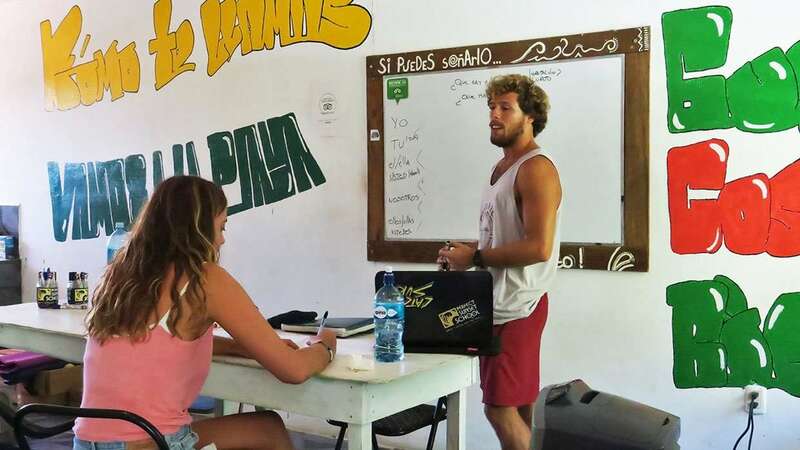 You will learn all the basics of how to communicate with plenty of time left over for surfing , relaxing on the beach and exploring Costa Rica. Our interactive methods of teaching and the teaching materials have been designed to satisfy communication needs from the simplest to the most complicated, making the development of both written and oral expression easy. Grammatical concepts are assimilated in an easy and effective manner. Our Spanish Course consists of 8 or 16 hours each week. Classes are small with 2-4 participants per group. The course duration is 1 to 16 weeks. The level of Spanish spoken in class is adjusted to suit the levels and needs of the students. The Intensive Spanish Course has been designed to develop the student´s ability to effectively communicate in Spanish. Our Intensive Spanish Course (16 hours a week) use a modern communicative style to learning that encourages the use of a natural, contemporary Spanish. Over the years we have become experts in delivering high quality Spanish language courses for students of all ages and levels. The lessons focus on improving the four essential skills (speaking, listening, reading and writing). Our classes place particular emphasis on speaking, as this is the key to communication. For maximum individual progress we have a maximum of 4 students per class. This course aims to provide you with a grounding in the basic grammatical structures of Spanish. Though the emphasis is on speaking you will also learn grammatical structures and sentence pattern, which will form the basis for further progression in Spanish. You will learn to read basic messages, letters and texts, understand authentic dialogues and produce your own dialogues in group and/or pair work exercises during the class. If Spanish is new for you, the basic spanish program will give you all that you need to love this lenguage! If you want to learn Spanish in Costa Rica try with us. We believe that you will not only learn the Spanish language in a classroom, Perfect Sunset School gives you the possibility of establishing relationships with native Spanish speakers.